Since you’ve started reading a Keurig K575 review, sit back tight. There is a lot of incredible news that will make your jaw drop. This Keurig beast of a brewer is basically everything a coffee lover ever needed to have. The K575 is a brewer that is an all-in-one brewer. It has a lot of space, offers a lot of options and most importantly – it brews excellent coffee. Even if you are the pickiest coffee drinker, you will surely find yourself enjoying the coffee from the Keurig. One of the best things about it is that it has an amazing 80 oz water reservoir. It basically means that you fill it up once, and you don’t have to fill it for a lot of time in the future. With such a large water tank, you can definitely brew around 10 regular sized cups of coffee before having to refill it. This surely saves you a lot of time in the long run. Additionally, it offers options for all kinds of things that you can imagine. Specifically, you can choose from nothing less than 8 cup sizes. They range from 4 to 30 ounces, which is an incredible feature. 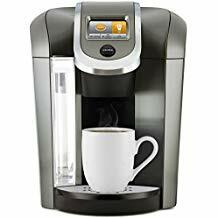 Regardless of how large you like your coffee – you know that this Keurig will bring it to you. On the same topic, you also get to choose the temperature of your coffee – so if you are in a hurry, you will surely save a lot of time. Specifically, you will be able to choose from no less than 5 different warmth options, for every occasion and every reason you can possibly imagine. Additionally, If you have a preferred strength of coffee like all true coffee lovers, we have more good news for you. With the K575, you can choose the different strengths of your coffee too. In addition to everything we already said in our Keurig K575 review, we still have great features to present that the Keurig offers. For instance, this coffee machine saves you a lot of time because if you need, you get on-demand hot water as well as hot cocoa. So, pour yourself another cup of tea, because you’ll get it in a manner of seconds. Moreover, the K575 also has a very cool and stylish 2.8-inch touch display screen. You can use this screen to control everything that is going on with your brewer. More importantly, this touch screen also adds to the overall design and the style of the brewer. The touchscreen display has an effect on the overall modernism of the brewer – a 21st-century brewer. It’s an optimum size and you can see and read on it clearly. Also, the display has a digital clock when not actively being used. It makes it look sophisticated and it can easily fit into every kind of kitchen and interior design – even offices. Lastly, we should mention the existence of the water filters in this brewer. Namely, these water filters make sure that your coffee is brewed from clean water, also improving the taste of your coffee. So, in the end, this would mean that you will be drinking coffee made in clean water. The same one will have a richer taste and better aroma. The small things are what make a coffee maker so special – and the K575 has every small thing that makes it big. After reading our Keurig K575 review, we simply know that you also believe that this is one of the best ones in the world because it actually is. Most importantly, it is exactly why this brewer is such a valuable investment.